Trump made the remark in an interview with The Hill. 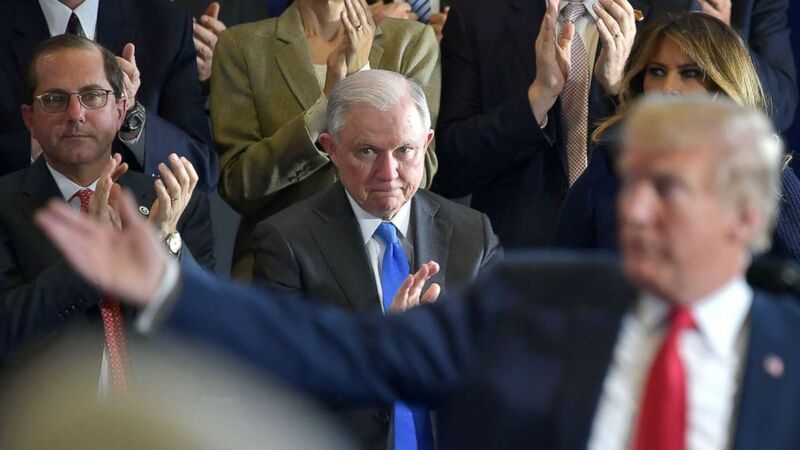 According to the news organization, the president repeatedly expressed his “disappointment” with Sessions for recusing himself from the Russia collusion investigation. Trump said his unhappiness with Sessions extends beyond the Russia investigation. Trump also referred to Sessions as “mixed up and confused” in the interview and claimed that Sessions’ former Senate colleagues were “not nice” to him. In this file photo taken on Dec. 15, 2017, President Donald Trump sits with Attorney General Jeff Sessions in Quantico, Va., before participating in the FBI National Academy graduation ceremony. Trump’s attacks on Sessions are well documented. Over the Labor Day weekend, Trump took swipes at Sessions over the indictments of Rep. Chris Collins, R-N.Y., and Rep. Duncan Hunter, R-Calif.
“Two long running, Obama era, investigations of two very popular Republican Congressmen were brought to a well publicized charge, just ahead of the Mid-Terms, by the Jeff Sessions Justice Department. Two easy wins now in doubt because there is not enough time. Good job Jeff……” Trump said in a tweet.